thank you. glad to here that its easy, the Kato E5 is hard to add DCC to. next time your looking at it take some photos of the DCC plug, Thank you! The only issue I have now is finding one to buy. can you find any on Yahoo auctions? While I dont see any currently for sale, often just checking every day or so will have one show up sooner or later. Still waiting for people to post their photos of the HO JR500. Not trying to be pushy here I just want to see some photos and maybe some videos of it running. What's the fair price of the Tenshodo jr500 6 car set from Japan. how much would you say it's worth? I have a search running on eBay in the U.S. They pop up maybe once or twice a year - more often the 3 car sets. I think the 3 car sets are often $500 - $1000, but I don't remember exactly. I remember when it was readily available in Japan. You could buy individual cars. I think the original price was around $100 per un-powered car - this was perhaps 10 years ago. Since I do n-scale in Japanese trains, I haven't ever been able to justify buying one just to put it on a shelf and look at it. I would not buy an expensive train for display. Because 600- 800 dollars for a train is a lot for me, I would want it to run I would be running it and using it putting it to good use. 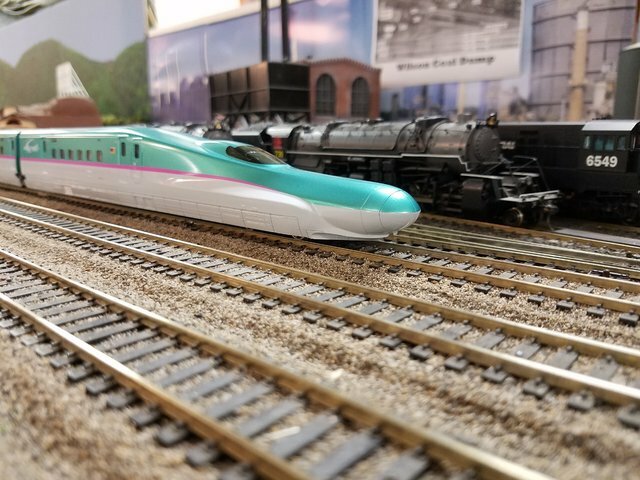 my plan for requiring the Tenshodo 500 series 6 car set will be signing up for a middle man service called ShoppingMallJapan they will have the lowest fees. It will likely take about a month to ship to the US I guess, and then i will buy three DCC decoders for it. and run it during shows at my club with my other trains. A 5 car set on eBay. Not cheap, but you could make an offer. I kind of want the 6 car version, but this is tempting. It is listed as "new" so chances are high that I will not get a reasonable price. I think I will pass on this one. I'd rather get the Hayabusa over the summer. The full set of 16 cars in what appears to be nearly new condition. Yeah no thanks. I know the guy that is selling it and I think its cheaper to buy from Japan than fight over it in the US. Well I'm sure some one will pay for it. Hi, new to the forum and also looking for a Tenshodo JR 500 in HO scale. Happy to buy either the 5 / 6 or 8 car set if anyone is thinking of selling theirs? Dude I am in the same boat. I know A guy that just threw away 3 grand for two 6 car sets. 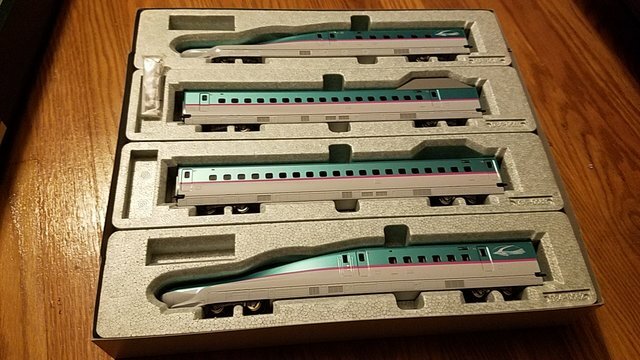 I have been asking around and it seems like no one has them and those that do have HO scale shinkansens of any kind don't want to sell it or are greedy as hell and unless your willing to donate an organ(lol) its gonna be difficult. I have been trying to get this train for almost a year. I truly care about the train and breaking up with it resell would be hard for me anyway, well that is once I have the dang thing in the first place. SO how much are you willing to pay for one? James. You never know whose going to come out of the wood work and sell you one. So I bit the bullet (pun intended!) and forked out some cash for a six car set that came up on eBay. Have to say I’m in love with this train. Now I just need the additional cars! The 4mb limit won’t let me upload videos. At the moment it’s being tested on the floor in my apartment but when I get back to the UK at Christmas I can fit the decoders for the headlights and run it on my layout. The limit won’t let me upload videos. I can send you some via email but at the moment I have it running around the floor in my apartment in Asia. Won’t get to stretch it’s legs on my layout until I’m home in the UK at Christmas. If you post your videos to YouTube you can embed them here in your posts. Sorry but allowing video uploading would end up costing us on server space in the long run. nice train! You have needforspeed salivating like a dog in front of a steak! Nice! Did it ship from some whare in Florida? Because the only 6 car ones I know of on eBay are sold from a guy down in southern Florida he buys them from Japan and price hikes them on EBay. So you must have paid at least a couple of grand for that. I looked into buying one from him a while ago and he was charging a considerable amount. so I said fine I'll buy mine from Japan like you do and after a ton of research I found out about Yahoo and I found out that they are like 35% to 50% cheaper over their, compared to what the guy in Florida was going to charge me. So he must be making a ton of money if that's who you bought it from. Are you from Britain? And you have an apartment in Asia? You must be quite the world traveler. 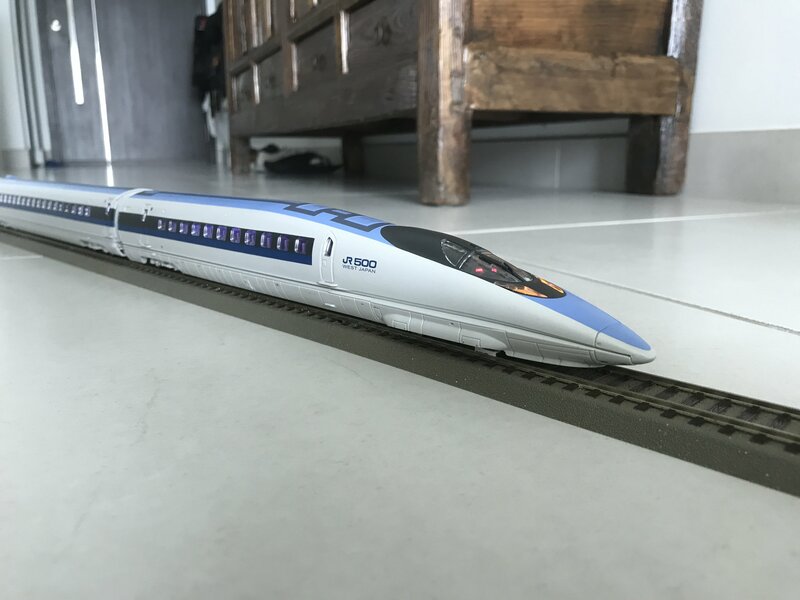 Hope to see some Chinese high speed models in the near future. FYI, when you install DCC their is 8 pin plugs in bothe cabs and the motor car so it should take you like 5 minuets. Yes please keep all private info like emails, phone, addresses etc in PMs. This is a public forum (ie totally open to read) so we don’t want anyone’s private information posted here (the @s just attract the spam spiders as well!) This is all in the new updated guidelines. An old timer at my old model club had one of these. I dont have pictures or vids, but I saw it run once, and it was really fast. I have Tenshodo steam, which is scale speed accurate. 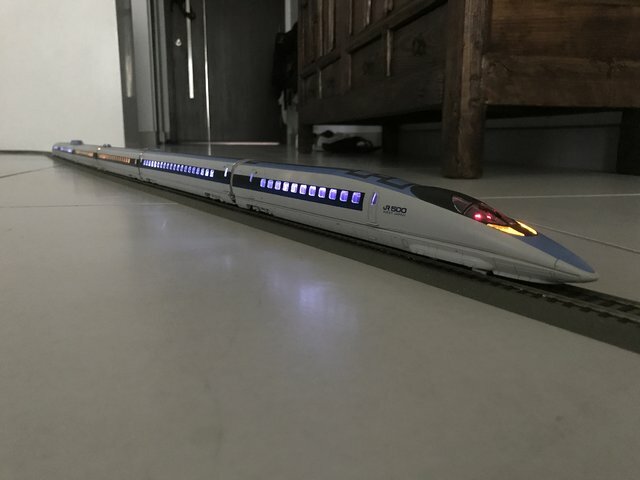 Is this model also scale speed accurate? I bought this from the guy in Florida (for a very reasonable amount) but I got the additional 4 cars direct from Japan. 10 cars is enough for me at the moment. I’m totally in love with this set! I’ve also picked up the Kato E5 but that’s gonna need some work to get it all running on DCC. Happily the guy selling it in Japan has already bought and installed the interior lighting in all the cars. Recorded some brief videos tonight. Will do a better one once I’ve fitted the E5 with decoders as well. Well I won an auction for a Tenshodo 500 series in Japan last week, it will get here soon. I also just got a E5 to. I had to solder in a decoder in the power car but for the cabs, I sware they designed it to fit a N scale FL-12 decoder, I have them on order but their are a lot of delays at Kansai apparently so I will wait to see If I get them. Here is another photo of it on a lay out the cabs can run on DCC with no modification, but you wont have working directional lights.